Enyo joined ACD in 2010, while attending Parliament Hill Secondary School and then LASWAP Sixth Form Consortium. Enyo says, the activities and discussions ACD arranged in the week-long stay in Cambridge taught her about taking responsibility for her actions and working towards her dreams with each choice she made. She has spent time volunteering in charity shops, as well as in school and in her local library. In particular, she has a passion for helping dyslexic children love books and experience the joy and benefits of reading. Enyo also has a long-term goal to develop a mentoring society and recreational centre based on her experiences of the power of mentorship, both as a mentor and a mentee, in creating confidence, inspiration and resilience in other individuals. 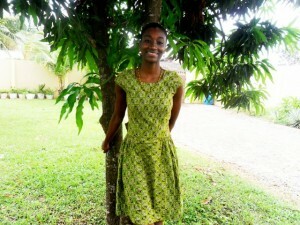 Currently, Enyo is living in Ghana enjoying another culture and improving her language skills. She is interning at a Ghanaian Accountant/Audit firm until August 2015, while she hopes to get admission to Ashesi University to pursue a Business Administration degree. ACD Alumni-Where are you now? Please help us keep our addresses up to date and let us know where you are.